The Transportation Weighment division manufactures & markets Rail Scales, Axle Scales and Special Application Weighing Products. Offered available by us is a wide conglomerate of In Motion Rail Weighbridge Car/Wagon Loading Systems, which is manufactured using premium grade raw material. These products score high on quality, functional life, durability and reliability. ERIM is a tailor-made Rail Weigh in Motions used for trading applications which can be installed, made functional in hours and is RDSO approved. Our knowledgeable team are engaged in developing solutions for every rail user, from end users to raw material producers and infrastructure developers. ERIM provides accurate data on the weights of trains and wagons, which can be linked with your business systems via Computer, networks and internet. This helps you in monitoring the deliveries to customers or from suppliers as reports are linked to individual wagons, destinations and loads. 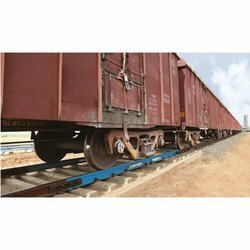 System helps in monitoring imbalanced loads by automatically detecting wheel, axle, wagon overloads, therefore avoiding multiple times weighing of the same vehicle, thus avoiding overloading penalties and ensuring safety. 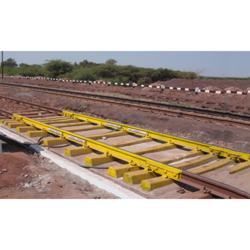 Dynamic weighing systems are designed for calculating the weight of the loaded railway wagons upto the speed of 15 kmph. It uses the quad sensor full bridge techniques which are a part of load cell sensor technology. Strain gauges that are being used are imported from the world leader in strain gauge technology. Accuracy, reliability and consistent performance areassured as these modular electronics are Micro-processor based. Prints outs for rail weightment and reports of MIS can be generated with the software. Accuracy of bigger than ? ?±0.25% for abounding train. Suitable for industrial applications such as petrochemicals, extraction, cement, ores, steel, recycling & ports. Precise weight data reports can be interfaced with your clients business systems via PCs, Ethernet, Internet. Recognized as a reliable organization, we are providing Rail Weigh Bridge to our customers. These bridges are developed under the guidance of engineers, who are well-versed in this domain. 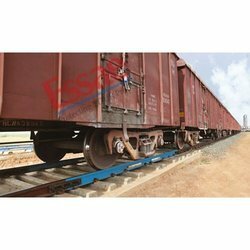 Essae Digitronics In Motion Rail Weigh is a High precision dynamically weighing Scale Designed for Weighing of all types of Indian Railways Wagons and Elimination of all types of Locomotives at speeds up to 15 Km/h. Essae Rail Weigh-In-Motion (ERIM) / Rail Scale, Essae Digitronics - one of the country’s leading weigh scale manufacturers having the largest number of Rail in Motion Scale ??? operational nationwide provides solutions for all these challenges and more. ERIM is our RDSO – approved tailor-made train weighing system for trade applications that can be installed and made operational in hours. Our specialist team develops solutions for all rail users, from raw material producers to end users & infrastructure developers. ERIM provides precision data on train and wagon weights that can be interfaced with your business systems via PCs, Ethernet or Internet. Reports can be linked to individual wagons, loads and destinations to help you monitor deliveries to and from customers and suppliers. By automatically detecting wheel, axle and wagon overloads, the system helps you to identify imbalanced loads and avoid multiple weighment of the same vehicle ensuring safety and avoiding overloading penalties. • This solution enables manufacturers to carry in-motion weighing of all types of vehicles at the point of manufacture or testing, such as the inspection pit, providing instant availability of data. • The solution can be designed for static and/or in-motion weighing of wheels, axles and bogies and for full draft weighing of locomotives and all types of rolling stock. It is used for quality control of maintenance and manufacturing procedures and for adjusting wheel and bogie suspensions to ensure balanced loading. • The equipment caters for electric and diesel locomotives with the full range of rolling stock. Design, manufacturing, installation and after-sales support over 86 locations across the country. Looking for Rail Weighbridge ?